The text on the graphic says: Your Cost To Finish. 3 Options. 1) Hire A Contractor. Complete package of finishes. 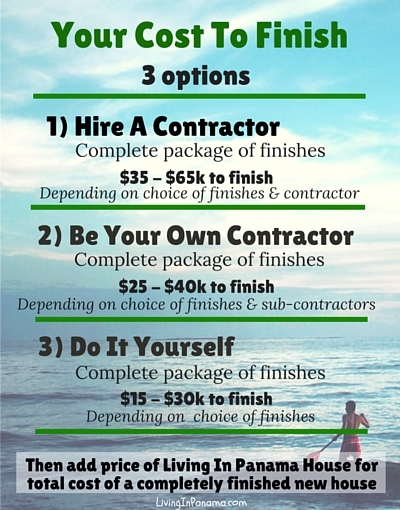 $35 – $65K Depending on choice of finishes & contractor. 2) Be Your Own Contractor. Complete package of finishes. 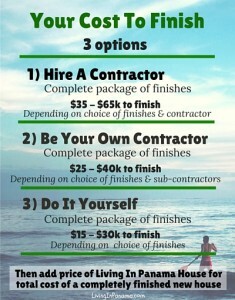 $25 – $40K Depending on choice of finishes & sub-contractors. 3) Do It Yourself. Complete package of finishes. $15 – $30K Depending on choice of finishes.